Corrective upper and lower jaw surgery is performed by our oral and maxillofacial surgeons at Pacific Oral Surgery offices located in Ventura, Thousand Oaks and Simi Valley. Jaw surgery, or orthognathic surgery, is performed to correct functional problems. However, our patient’s physical appearance may be dramatically enhanced as a result of corrective upper and lower jaw surgery. Jaw surgery, maxillary osteotomy (upper jaw surgery) and mandibular osteotomy (lower jaw surgery) are performed at Pacific Oral Surgery to correct jaw bone position, balance the skeleton, and improve functionality, bite, and appearance. 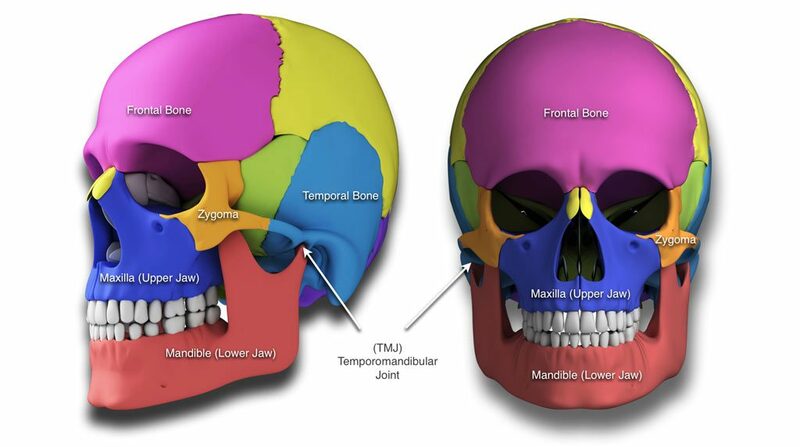 Both portions of the jaw, the maxilla (upper portion) and the mandible (lower portion), can become out of alignment due to injury, congenital conditions, pathology, or jaw growth issues. Surgical intervention is often required to improve the jaw alignment to alleviate symptoms and enhance appearance. Depending on the severity and cause of the misalignment, a patient may need upper jaw surgery, lower jaw surgery, or both (called maxillomandibular advancement). Both upper and lower jaw corrective surgery are performed by accessing the jaw bone through the mouth and no incisions are required on the outside of the face, thus eliminating scarring. Upper jaw corrective surgery (also called maxillary osteotomy or Le Fort Osteotomy) is an orthognathic procedure that can be utilized in patients who have a receding upper jaw, open bite (malocclusion in which the upper and lower teeth do not come together), or cross bite (misalignment of teeth in which the top teeth fall inside the bottom teeth either in front or on the sides). When upper jaw corrective surgery is recommended, the process typically begins with the placing of dental braces which slowly guide the teeth into the desired alignment for the upcoming jaw surgery. Because braces may need to be worn for up to 18 months, your oral surgeon will be working closely with your orthodontist prior to your maxillary osteotomy to monitor the alignment progress. Once your teeth are in proper position, your upper jaw corrective surgery can take place. During the procedure, you will be under general anesthetic. Your maxillofacial surgeon will make an incision in the gum of your upper jaw (under the eye sockets and above the teeth). A small, specialized electric saw will be used to cut the upper jaw bone which is then precisely moved forward into a position that will allow your teeth and jaw to fit together properly. Using 3D technology, the positioning of the jaw is determined prior to the operation during surgical planning. This 3D imaging allows your surgeon to simulate your surgery and make adjustments before the procedure ever begins, thus improving accuracy. Once the upper jaw is properly positioned, it is held in place with small titanium plates and screws that are safe for the body and eventually integrate into the jaw bone as healing progresses. Your oral surgeon then uses dissolvable sutures to stitch the gum back into place. Elastic bands are placed between the upper and lower jaws which assist in guiding the jaw into the new position. In some cases, portions of the jaw bone that may be keeping the teeth from touching will be removed during your upper jaw corrective surgery. The maxillary osteotomy typically takes approximately 3 hours to complete and requires a 1 or 2-day hospital stay. Lower jaw corrective surgery, or mandibular osteotomy, is performed to reposition the lower jaw to bring it into proper alignment with the upper jaw and skull. Mandibular osteotomy is utilized for patients with a severely receded lower jaw which can result in difficulty chewing, biting down, and speaking. Many patients also have aesthetic concerns over the appearance of their overbite due to the receded lower jaw. As with upper jaw corrective surgery, orthodontic treatment is typically required prior to lower jaw corrective surgery. Your oral surgeon will work with your orthodontist to create your individualized treatment plan which will include wearing braces for several months to position the teeth appropriately for the jaw alignment procedure. 3D imaging will be used to simulate your procedure and make any necessary adjustments in your surgical plan. During lower jaw corrective surgery, you will be under general anesthetic. The orthognathic procedure usually takes 2-3 hours and requires a 1 or 2-day hospital stay. Your oral surgeon will create an incision inside the mouth in the gum located near the back molars. The exposed jaw bone is then cut slowly with a small specialized saw on a predetermined downward, oblique line. The lower jaw is moved into proper position to align with the upper jaw. Using a plastic wedge to hold the newly cut jaw bone in place, your surgeon then secures it with titanium plates and screws which will remain permanently and eventually integrate into the jaw bone. Once the plates and screws are secured in the lower jaw, the gum is stitched back using dissolvable sutures. Elastic bands are utilized to hold the jaw into its new position, and these will be monitored and adjusted at future appointments. Recovery from upper and lower jaw corrective surgery is very similar. Small elastic bands will have been attached to your dental braces during your procedure. These bands will help keep your jaw aligned in the correct position after orthognathic surgery, but will hinder you from being able to open your mouth fully. These side effects from corrective jaw surgery are expected and will subside gradually as you heal. Ice packs will be provided to minimize swelling, and intravenous antibiotics will be administered to prevent infection. Pain medication will be given to you in hospital, as well as prescribed by your oral surgeon for use at home, for usually 2-3 weeks after your jaw surgery. Your diet after upper and lower jaw surgery will consist of soft foods for approximately 6-8 weeks after surgery. You can utilize a food processor or blender to puree any foods that you would like to eat. There are many recipes available on the internet to keep your nutrition up and your diet varied. Continuing with good oral hygiene will be an important part of your recovery. Gently brushing your teeth and rinsing with mouthwash will help prevent infection. A follow-up appointment (usually with your oral surgeon and orthodontist) will be scheduled about a week after your jaw surgery. Periodic appointments will be required to adjust the elastic bands and monitor healing and jaw position. You should plan to take at least 2-3 weeks off work or school and refrain from heavy manual labor, hard physical activity, or vigorous exercise for several weeks, as well. Your surgeon will advise you on when you can return to all normal activities. Avoid any activities during which your face could be hit or injured until your doctor releases you to do so. After your jaw is stabilized (usually 6-8 weeks), your orthodontist can finish the alignment process on your teeth to complete treatment. This entire jaw alignment process usually lasts 18-24 months in total. Eat 5-6 small, high-protein, high-calorie meals each day to maintain weight and nutrition. It is not unusual to lose 5-15 pounds after jaw surgery due to diet change. Use all medication as prescribed by your doctor. Contact your oral surgeon if nausea or pain persist or if you are concerned about any aspect of your recovery. Elevate your head while sleeping for the first 2 weeks after your jaw surgery. Use nasal spray twice a day if needed. Use lip ointment to avoid drying and chapping and reduce lip swelling. Incorporate spices to blended food to enhance flavor in your meals. Do not worry if bowel movements change as this is normal with a new diet. Using a straw is fine if comfortable for you (it may be difficult in the beginning when lips are swollen). As with any surgical procedure, complications are a possibility during corrective jaw surgery. Complications are extremely rare with upper and lower jaw surgery, and when they do occur, can typically be addressed and corrected with little to no adverse long-term effects to the patient. Significant bleeding: In rare cases, a patient may require a blood transfusion during surgery due to excessive bleeding. Infection: Occasionally infection may result from the plates or screws used to hold the jaw bone in place. If this type of infection should occur, your surgeon will remove them. Typically, if this happens, it is several months after the initial jaw surgery. Need for additional procedure: Although rare, in some cases, a second smaller surgical procedure can be required to reposition plates or screws if the new bite needs to be adjusted. Sometimes a secondary procedure is necessary if the jaw bone is not healing properly (more common in immunosuppressed patients and smokers). Gum or teeth damage: If the blood supply to the teeth or gums is compromised, the result can be gum recession or the need for root treatment (more likely for immunosuppressed patients and smokers). The Pacific Oral Surgery team will be available to you throughout each phase of your corrective jaw surgery treatment. Our goal is to provide you with improved functionality and health, as well as enhanced appearance which will bring positive change to your life. If you would like more information about upper or lower corrective jaw surgery, please submit an online appointment request or call one of our Pacific Oral Surgery offices located in Ventura, Thousand Oaks and Simi Valley.